There are Trans Am owners who want it to restore thier cars and then there are Trans Am owners who want to REALLY restore thier cars. This kit is the MOST COMPLETE IN THE INDUSTRY. This is by far the MOST complete kit in the industry PERIOD. 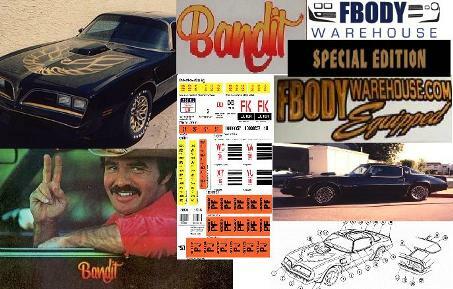 For 1977 and 1978 Trans Am Special Editions with German Style Font Decal Package. Be sure to use ALL of the drop down menu boxes to ensure you get the best kit for your car's exact needs! NOTE: We will also email you an additional form to complete in order to complete the replacement spec decals portion of your order. ALL SHIPPING COSTS ARE INCLUDED IN THE PRICE! THIS COMPLETE PACKAGE INCLUDES ALL OF THE FOLLOWING. 1 Windshield Decal 2 Styles! FULL Replacement Spec Decal Kit 8 or more Decals! 2 Shaker decals YOUR CHOICE OF STYLES! Allow 14-21 days for complete delivery as this kit comes from 5 different producers. Domestic shipping included. Canadian and international orders, please use drop down menu to select shipping location.